In honour of the start of Spring, Vince Camuto recently asked a few bloggers to wear our new Two by Vince Camuto Utility silk shirts while highlighting a favourite local spot. Because I definitely spend a little bit too much time and money on trying things (particularly food) around the city, it certainly took some time to settle on what to feature. After much deliberation, I decided to share Faubourg with you guys: with amazing pastries and high tea, great coffee and the fact that it’s located in one of my favourite neighbourhoods, it’s definitely one of my most-loved places to spend an afternoon. Now for a fun little giveaway: I’d love to “Discover” what your favourite local hotspot is in your hometown! 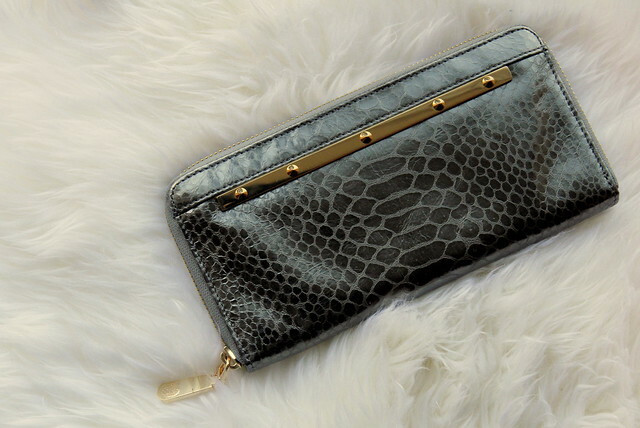 Let me know in the comments below (along with an email address for me to contact you at) for a chance to win this lovely Vince Camuto python/studded wallet! Ends EOD Friday Mar 1, Open worldwide. Love this chic look and great pics. Love the outfit. The blue color is so pretty! The macaroons and tart look so delicious! Ah, I love/miss Faubourg! Their high tea is quite good and much better than the place I went to here in Manchester… Disappointing, considering I’m in England! Love the cobalt blue with black as it makes for such a sophisticated and luxe palette, especially with the textures you’ve put together. I have two little known places, “Taste” which looks really similar to your “Faubourg”! Same kind of place. Then there is also a really low key, whole in the wall place named “Unleavened Bread Cafe” which has such a precious story. A older christian woman sold everything she had to open this place that basically only sells tea, coffee, and pastries. She hires battered women coming out of hostile homes or who have criminal backgrounds. Most of her customers are people meeting for bible study and stuff like that. If you are ever in Indy, let me know! I’m from Baltimore, MD and there is a great coffee/pastry place called Artifact Coffee in Hampden. I love the atmosphere, food, and everything about the place. There’s also a brunch place next door, Woodberry Kitchen, which I believe are sister restaurants and the food there is equally amazing! I love the little coffee shops and cafes in Lonsdale. Plus they have some great vintage shops to browse as you sip your tea! I live in Salerno (Italy) and my fave is ‘Pasticceria De Riso’ in Amalfi coast! 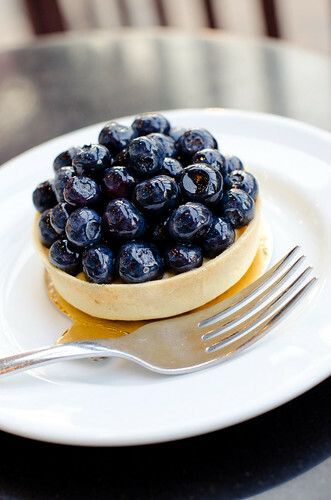 that blueberry tarte looks so delicious! i’m glad spring is finally showing up near you too. my favourite place in columbus, ohio is a little french pastry shop with the best macarons! I live in Norfolk, Virginia, a still-growing mini-city of sorts with SO many little hidden gems. I feel like I’m lucky to be a part of something new and exciting living in a city with so much undiscovered charm. We have this little bakery called Chocollage tucked away in a corner downtown, with comfortable seating for maybe 8 people MAX, but they serve the prettiest, sweetest little pastries and coffees. My husband and I have made a commitment to eat/buy local and support the growing community! always_lge at yahoo dot com. The blue looks awesome on you! I love it! and I loved this pizzeria where I went to school in Kingston Ontario called Woodenheads! It was so delicious and I loved the decor and atmosphere in general! It was also great to support local businesses! That blouse is available in such pretty colors! I love the blue on you, and I also loved how you styled it. Finding a favourite place for coffee/snacks is a little bit limiting since I have to eat gluten-free and there aren’t many coffee shops that cater to that. There is a really cute place called Fusion that, among gluten free pastries, also make sweet or savoury crepes. Yummy! Thanks for hosting such an awesome giveaway! One place I love to visit in Toronto is Cora’s, which is a restaurant specifically or breakfast/brunch! It’s decorated with brightly coloured giant photos of different breakfast items and each location always has large windows to light up the place. I have to say, one of my favourite days is going to 49th Parallel on Main St., getting a latte and lucky donut and browsing around the little stores on Main. It’s a perfect Sunday activity. Fave spot is D’Lick cafe in my small town. My fave spot to visit almost every weekend is Cosy’s Snack Bar in Halifax, NS. It is a little hole in the wall with amazing food and even more amazing staff! I’m there so often they know me by name! Awesome giveaway and I must say that I love your style. It is so classic and fashionable! My favorite hotspot would hands down be Star Noodle. Sure, it’s the sister restaurant to the company I work for, but my opinion about the place is truly unbiased. First off, I love the location of Star Noodle. It’s industrial setting is uncommon and surely off the beaten path. It’s unexpected location also includes amazing sunset views and neighboring islands. The hip decor of the restaurant makes you forget that you’re in our little quaint Lahaina town. If you ever visit Maui, dining here is a must! The wait (which is normally 30 – 45minutes) is totally worth it. And not to mention, you may run into executive chef (and top 3 of this season’s Top Chef), Sheldon Simeon! Star Sighting. Woo hoo! Thanks for hosting a great giveaway, Jen. Crossing fingers and toes. My go-to weekend spot for a latte & treat followed by a walk on the beach is Viva Fine Foods & Bakery on Yew St. in Kitsilano. Best. scones. ever. They even have a healthy scone packed with nuts, seeds and dried berries that is so so delish. I’ve heard so many good things about Faubourg and can’t wait to try it out some time soon! When I have free time, I like dropping by Thierry for coffee/desserts! My favorite local spot (at the moment) is a little French Bakery on the lake called St. Honore. They have delicious desserts and quiche and croissants! Vince Camuto is one of my favorite brands and this is such a cute post/giveaway w/ gorgeous pics! My favorite place is any coffee shop really where I can write… but on campus, my favorite is definitely Coupa Cafe… the best chai in the world + yummy baked goods and outside, too! My favorite local hotspot is Harmony Cafe. Not only do they serve a wide variety of vegan, vegetarian, and gluten free options they also open up their venue to many local groups. On a typical night you may find a local artist preforming, a support group, or a book reading. It surely is pretty beautiful, and I would love so much to have it!! In Boston, I recommend Flour Bakery + Cafe, which has four locations in the area. Love your look here Jen! My local hotspot is Pete’s Frootique. It’s a grocery store/produce market/lunch spot/smoothie bar that has the most amazing selection. The raspberry power lemonade is soooo fantastic. Fingers crossed for the wallet! My name is Sarah and I’m from Edmonton, Alberta. A favorite hot spot of mine would be Duchess Bake Shop(http://duchessbakeshop.com) in Edmonton’s celebrated 124th Street, known for its one of a kind boutiques and delicious local eateries. I can’t help but cave into my cravings every time I’m strolling or shopping in this area. It’s a great place for a date night, day out with friends, or a spontaneous walk in by yourself! There’s always an alluring aroma that draws you into their ornate ambiance as you are greeting by appealing treats and welcoming service. 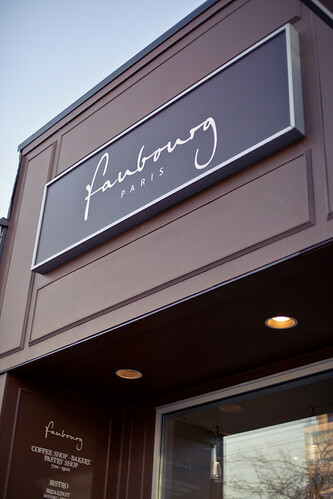 P.S Faubourg will be on my list of to dos next time I’m in Vancouver! I love this post! Thanks for sharing your fave hangout place. My favourite places to go in Vancouver are Salt Tasting Lounge and the Lobby Lounge at the Fairmont Pacific Rim. Such great places with amazing high energy atmospheres. We are blanketed by snow in Ottawa! My have hang-out here, aside from the shopping malls, is a Japanese/Asian Fusion rest called KINKI! I’m really inspired to do a post on this now… my favorite spot to eat is in East Oahu on the east shore in a town called Waimanalo. It’s an outdoor type eatery (many are here in Hawaii) with a walk up counter and informal serving – You wait for your name to be called and you pick up your food on a tray from a window of a trailer (where the kitchen is), which is connected to the cafe. The food is 90% locally sourced from Island farms and Island-grown meats and dairy, most of it is organic and has a wealth of vegetarian and vegan options (which is good for me and Nate) amongst the delicious meat. Featured on The Food Network for their Hawaiian inspired dishes, the place is popular with locals, but is gaining momentum with tourists alike. And, conveniently located right along the main highway, it’s a great stop for a delicious gourmet smoothie and local style dessert as a snack on your way back into Honolulu after an afternoon spent frolicking on the amazing white sandy beaches of the East Shore! We have been guilty of stopping here on the way out to the beach, and then again for dinner on the way home. It’s definitely one of my favorite places to eat on the entire island! My favorite local hot-spot is Old Town where there are tons of restaurants and shops. Thank you for the lovely giveaway! My hot spot was Starbucks beside Winners. It was two of my favourite place right beside each other. Until the renovations and I lost my Starbucks… Oh well. I heard they are building another one not too far from the previous location. i love, love, love la patisserie in south austin. it’s has such a peaceful atmosphere hidden deep in the fast pace of south austin. I have to say Porto’s Bakery and Cafe in Burbank. Seriously cannot get enough of their cream cheese pastries! I love Bel Cafe in Vancouver. It’s not exactly “hidden” but it’s a great little spot for an afternoon treat! I recently discovered a cute french inspired cafe called La Boulange. their coffees in and the amazing pastries. Thanks for the chance. In Hilo Town on the Big Island of Hawaii, the local hotspot on Wednesday and Saturday mornings would have to be the Downtown Farmers Market. Underneath huge blue tarp canopies you are enlightened by the sights and smells of Hawaii – local vendors selling fresh flowers (anthuriums, orchids, birds of paradise), produce (my favorite fruits like papayas, apple bananas, and mangos), goods (fresh berry jams, honey, coffee), and artisan jewelry and pottery. You need to dress light, wear good walking shoes, and always carry cash at hand to barter with the vendors. Hilo is a small town so you may recognize a familiar face and it is nice to “talk story” while you are there to shop. I always come home with a pretty flower arrangement and a full tummy of healthy goodness. =) Hope you come visit one day! I live in Charlotte, NC and I recently discovered a restaurant called The Penguin where fried pickles were on the menu! Yum! Great giveaway! My fave spot here in Vancouver is the Warehouse for good cheap eats. The blouse looks so luxurious and it’s such a wonderful bright shade of cobalt! Since we both live in the same hometown I’m sure you’re familiar with my favourite local hotspot, which is Provence Marinaside. I love to brunch there, especially during the summer. It’s so scenic on the waterfront and the food is always delicious. I must try out Faubourg, I’ve never been! hi my small town of Uzhgorod is all about coffee! So my fav place is a coffee shop named Medelin where i have my norning / afternoon and sometimes evening coffee! I am from Spokane Wa. we are known for the The Loof Carousel, the oldest in the country. It was installed in 1909. children as well of adults love it! I live in Northeastern Vermont. The closest city is about 1.5 hours away. My hang out is a place called Parker Pie- a 20 minute drive on muddy dirt roads leads you to some of the best pizza and beer in Vermont. The fashion rules are pretty country; picture carharrts, muckboots (with actual muck on them), and faded baseball caps. A python wallet would be a perfect addition. The Starving Artist is one of my favourite hang out spots in my neighbourhood in the west end of Toronto. It has amazing brunch (all centred around waffles!) and has a fun, down to earth vibe. Thanks for the chance to win! Thanks for the fun giveaway! I live in Louisville, KY, and there’s a posh little place called Please & Thank You. They have the best Blackberry Czech Bars…and coffee! And, they have vegan muffins (my favorite). My favourite Ottawa place by far is The Manx, a small, velvety basement pub a few blocks down the street from my apartment. They display the work of local artists, host literary events, and have an absolutely amazing menu. In short, if you’re ever in Ottawa, we’re going. That color is just gorgeous on you! One of my fave spots in Tampa is The Refinery. Organic, locally sources food…So good! I’ve been hearing really good things about Faubourg, I really have to go try out it sometime! No real hotspot here, but if we drive about an hour we can hit up Rodeo Drive and really look at amazing stores! i love to go to the local coop natural food store to eat, it’s called new leaf market and it’s got amazing food! I like an area called Virginia-Highlands in Atl. Cute shops, great restaurants and bars. 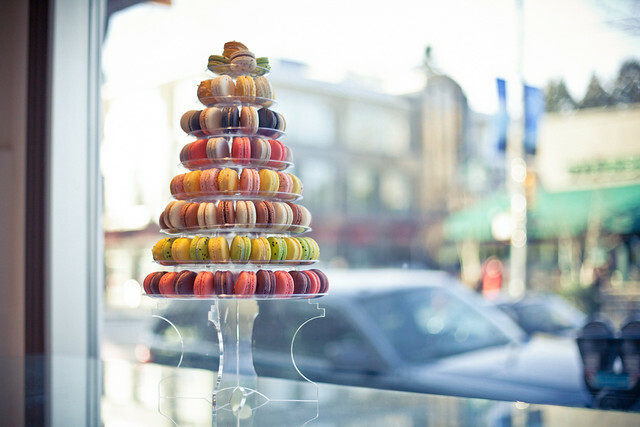 I’ll have to try Faubourg the next time I am in Vancouver! One of my favourite spots is Credo on Edmonton’s trendy 104 street. Love your blog! forgot to put my email address. LauraLeaBerry At Hotmail.com. My comment is above. Sadly, we don’t have many spots to hang out around here. Everyone loves a little local doughnut shop called Mr. Ronnie’s though. It’s more like a doughnut shop/diner type place. My favorite spot is this cozy little restaurant called Tavola in Vancouver, BC Canada. It’s such a hidden gem. The restaurant has a casual, laid back atmosphere and is unpretentious for the quality of food.